The Otjimbojo Wild Farm of Hans and Sylvia, spans an area of 3750 hectares. 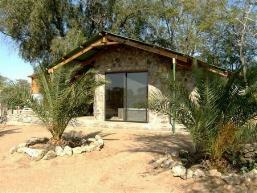 It is situated in the triangle of Wilhelmstal, Karibib and Omaruru along the dry river Khan. 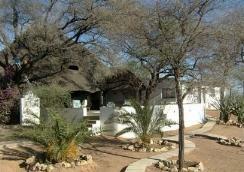 Idyllic and central establishment are approximately 200 kms North West of Windhoek and 200 kms East from Swakopmund. Host guests are accommodated in 3 double rooms, 2 suits and a single room, altogether have establishment 15 beds available. The rooms are equipped to high standards, with German plug sockets and 220 Volt plugs. Each room has a separate large bath with a shower, wash basin and separate toilet (approx. 32 square meters). The suites are divided into two areas with four beds and a separate bath/WC. Establishment have a large dining room for at least 12 people, a large lounge with an open fire-place, TV, DVD and music system for the guests. 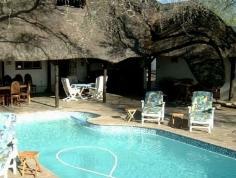 The swimming pool is part of the Lapa area and the favourite place for most of the guests. The swimming pool area is built with natural stones and the grill place too. There are numerous citrus trees in the garden and guests enjoy walking through the garden for relaxation. A whirlpool for 8 persons set in a natural stone house with glass doors, for observing the stars, there is also a Finnish Sauna accommodating 3 persons. Establishment have an excellent kitchen offering meats harvested from host own farm, the cuisine is highly praised by host guests. In the mornings you can sit down to a hearty breakfast, lunches are light and dinner is a sumptuous and generous meal. Establishment offer host guests a weekly laundry service which includes, washing of towels and bathrobes. Relax: Here you can for once, allow your soul to experience the peace and rest enjoyed by taking relaxing walks. These guided walks take you to host old tin mine and also to observe animals at the water holes. Game drives through the farm can be enjoyed at sunset. Other activities include swimming in the pool, sipping cool beverages at the lapa served with friendly conversations. If that's not enough for you there are even more activities including, watching DVDs or videos, reading a book from host library, listening to music, playing pool on host pool table, playing darts or any of the numerous other games establishment have available. Rides: Establishment have 23 farm style horses with a lot of Arab blood.. They are safe in the steps, with different temperaments and a height between 1,55m and 1,62m. Establishment ride with Kiefer-, Western- and Mc Lallen saddles, with broken bridle.. The weight of the guests that want to ride should not exceed 90 kg. Host game on the farm are accustomed to the horses, so with the wind blowing in the right direction, establishment get very close to Kudus, Oryx, Warthogs and Porcupines on horseback. Birds like the Black Combat Eagle and the Vulture are also easily observed on horseback. Guests will learn to recognize the paw and hoof prints of the various animals on the farm even the paw prints of the elusive leopards. Guests are divided into two groups according to riding ability. These groups will each have a guide who is able to speak German, English and an African language called Herero. The outride takes 4 to 5 hours, while the daily rides take 7 hours, including a picnic stop for lunch. The daily rides on host farm start off with a 16kms ride and increase each day to approximately 32kms. The riding pace varies between walk, trot and gallop, depending on the wishes and riding ability of the riders in the group. Each guest will receive a distance plan of the daily outride as a memento.